My wife, Mercedes, photographed this while passing Winco Foods in northeast Portland today. 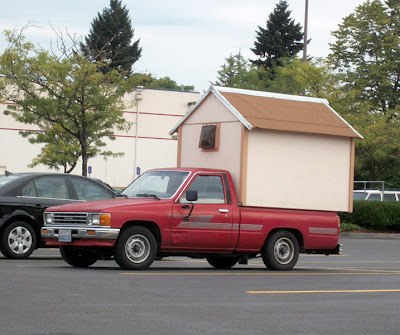 It is obviously a 1980s Toyota pickup with what appears to be a small shed in the bed. Some helper springs might ... help. Is it attached? It must be. I wonder what it's used for? Whatever the hell it is, it looks heavy.